Dawn on the left, mine on the right. 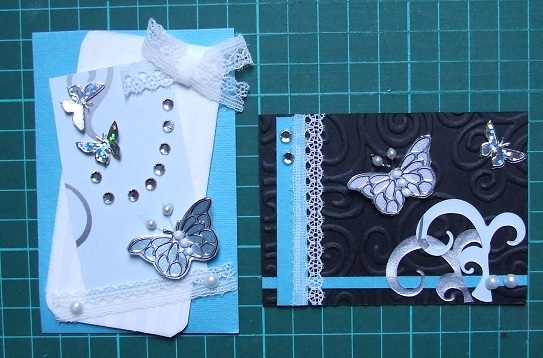 The turquoise card was double-sided, so I used the black side and some of the offcuts to add the turquoise. Quite different, but it is uncanny how we both used the beads on a wire to make antennae, and put three gems on the butterfly body. Yes, love those colours together, and again very different. Super those are. Both did a smashing job. Both very lovely and so different.